Jamie Hughes believes he must improve on his 5-1 quarter-final win over Wesley Harms to reach the BDO World Championship final. 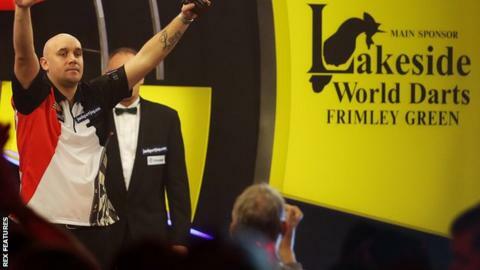 The number four seed from Tipton averaged 94.10 against Harms to reach the last four at Lakeside, where he will play 2013 champion Scott Waites. "I played very well but I'll probably have to play better," Hughes, 29, told BBC Sport. "It's going to be tough but I'm going to enjoy it." He continued: "I'm on so much of a high at the moment, I'm not thinking about what's coming up. I just want to enjoy this moment." Hughes was frustrated with below-par displays in the opening two rounds but showed real quality against Dutch fifth seed Harms to get to a Lakeside semi-final for the first time in his career. "That's what I've been waiting for all week," added Hughes. "I've been saying that if I clicked, someone was going to get a right hammering. That's given me a massive confidence boost." By reaching the last four, Hughes has automatically qualified for next year's World Championships. "When I came here, the semi-finals were the aim," he said. "I should be a more relaxed person over the next year because I haven't got to do as much of the circuit around Europe."